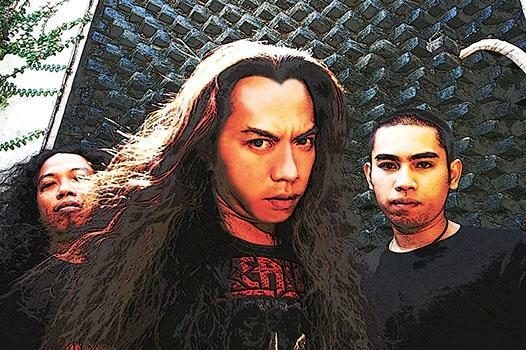 Created in year 1994 by Moel Madness (bass / vocal), Cax Wisnu (guitar) and Ari separatis (drummer). While making the first album ‘Offerings to Rangda’ , the drummer resigned and with the help of an additional drummer the album was released in year 1997. At the end of year 1997, after Eternal Madness have a new drummer Johan, a semi major label ‘Rotor Corp’ asked them to join ‘metaliklinik’ the first ever compilation album that was distributed nationally in local stores with the best metal bands in Indonesia. When the band started more serious, Cax Wisnu decided to put down his guitar and stoped his music career, then he was replaced by Didot (1999). At the same year Johan resigned, since that , Eternal Madness used drum machine when was asked again to join Metaliklinik 3 compilation and released the second album ‘Bongkar Batas’. In 2002 Death Ra replaced Didot .